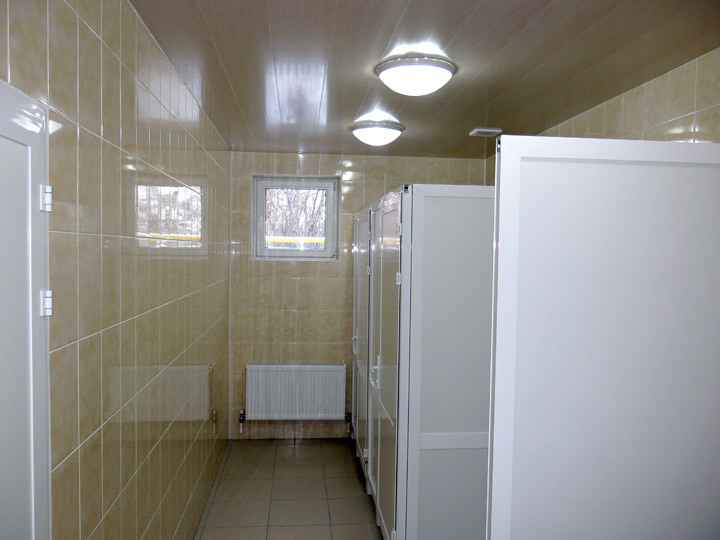 Almost every Moldovan village school has big problems with the sanitary facilities. They are usually built outside and are dirty, cold, without water and electricity. A similar situation was in the school of the village Gangura, district Ialoveni. The toilets were built outdoor and were not repaired since the opening year of the school (1967). Of course, these toilets were unhygienic. For this reason and that they were not heated during the cold period, children were always in danger of falling ill.
A solution was found, thanks to financing of Mrs. Beatrice Amann, President of Hilfswerk Liechtenstein, Triesen. 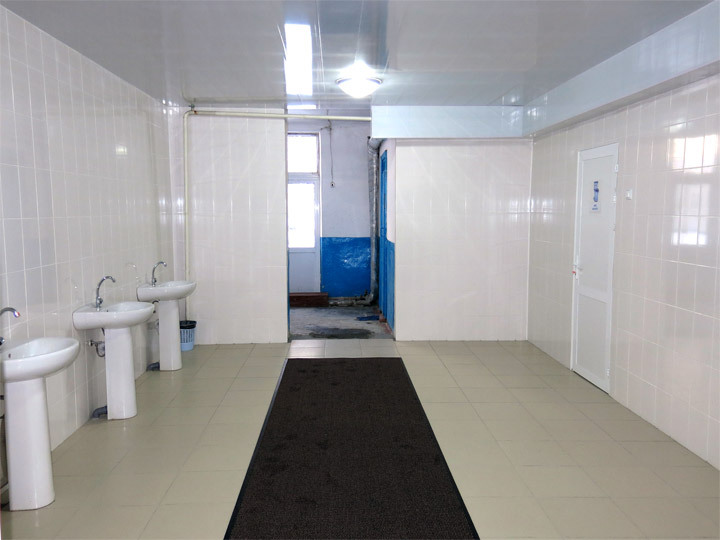 We could install inner toilet rooms with the necessary hygienic conditions: water supply, heating, electricity and ventilation, build the canalization system and repair the washroom by the inner toilet rooms. The children are very happy about everything that is done for them. 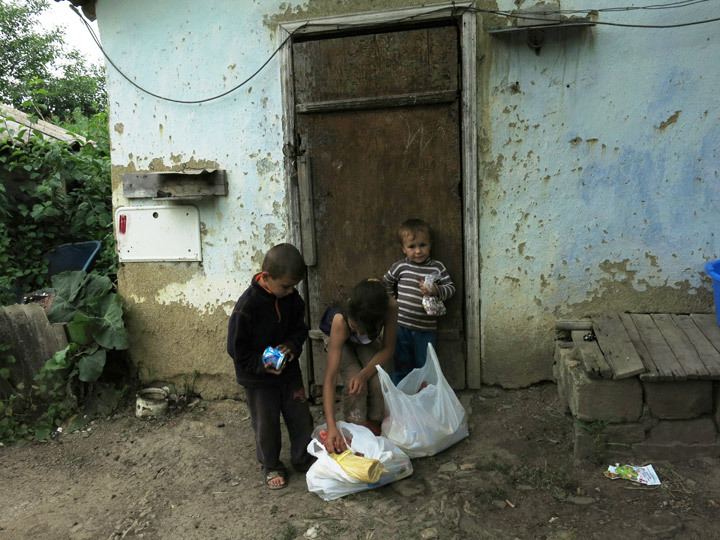 Plesca family is a poor family from Grigorauca village, district Singerei. It is a young, large family with five minor children. The living conditions of the family are very difficult. This family could experience great joy on Christmas. Thanks to the support of Mrs. Thea Cleophas / Belfeld and Mrs. Regina Weiss / Kaldenkirchen the following technics and food were purchased: gas stove, washing machine, sugar, flour, pasta, gingerbreads and other. Plesca family is very happy and grateful for the received goods. Many people, especially from the country side, have less or even no possibility to celebrate a beautiful Christmas feast. The Franziskusgemeinschaft from Pinkafeld / Austria and the organization Pro Moldavia e.V. 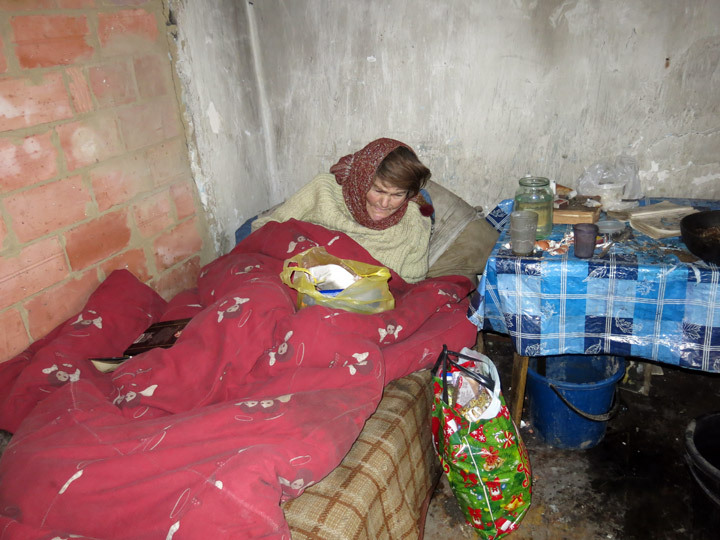 and the Thienel family from Gladbeck / Germany think always of these poor people and help them on Christmas Eve. 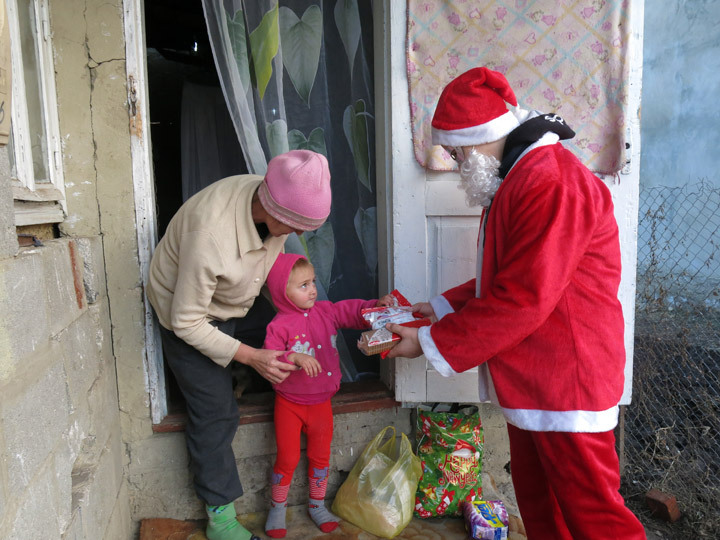 Food parcels on Christmas became a wonderful tradition. Twenty poorest families from Gangura, district Ialoveni (supported by Franziskusgemeinschaft) and eighty poor old people and families from Grigorauca, district Singerei (supported by Pro Moldavia e.V. 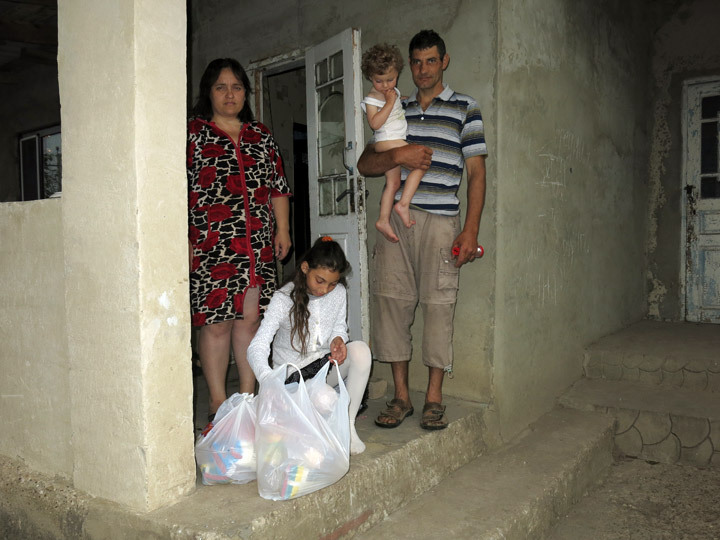 and the Thienel family) received food parcels: rice, four types of mushes, pasta, chicken meat, fish, sausage, mushrooms, sugar, flour, oil, butter, tomato paste, condensed milk, biscuits, sweets, rolled cakes, tangerines, and so on. The beneficiaries are deeply grateful for this action. The children from the commune Gangura received one of the most beautiful presents – a newly repaired and equipped kitchen in the local school. The kitchen wing and the dining-hall were not repaired since the opening of the school in 1967. The conditions there went beyond all hygiene standards. 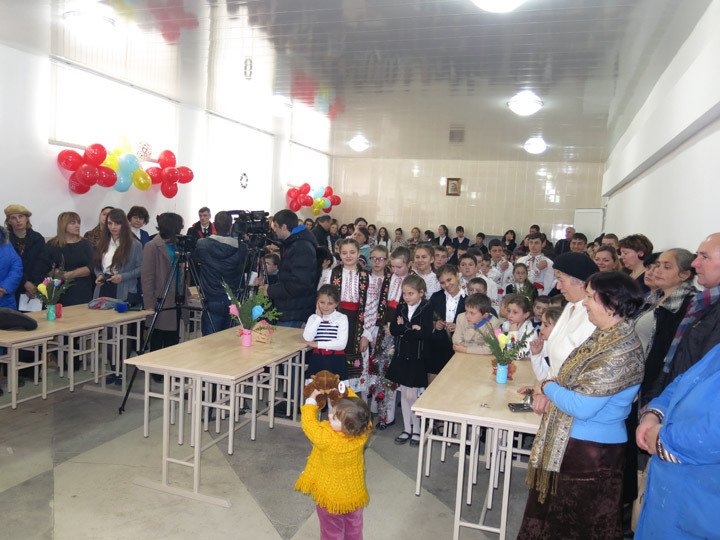 Now, the school has a newly repaired kitchen with modern equipment and a beautiful dining-hall with new furniture. The official opening of this project took place on 19 December. It is to mention that St. Nicholas day is celebrated in Moldova today. And what a better present could make Santa Claus for children, than a kitchen, where they may eat healthy and varied? Of course, Santa was there and distributed Christmas presents. Following guests took part in the official opening: the First Secretary of the German Embassy in Moldova Mr. Thomas Wagner, a Deputy of Moldovan Parliament, Vice Presidents of the District Council Ialoveni, the Mayor of the commune Gangura, councilors of the local administration, the school administration and of course all children and teachers from the school. The local priests blessed the newly repaired rooms. We express our profound gratitude to priest Hans Bock / Germany, priest Erwin Benz / Switzerland, German Red Cross Stande / Germany, PRO MOLDAVIA e.V. 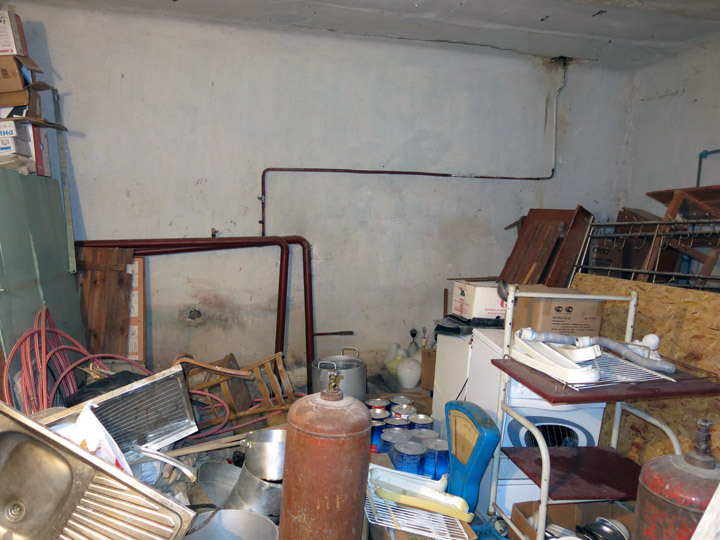 / Germany, Helen and Gerry Zühlke family / Switzerland for financing the repair works, the kitchen equipment, the furniture, the dishes and cutlery. 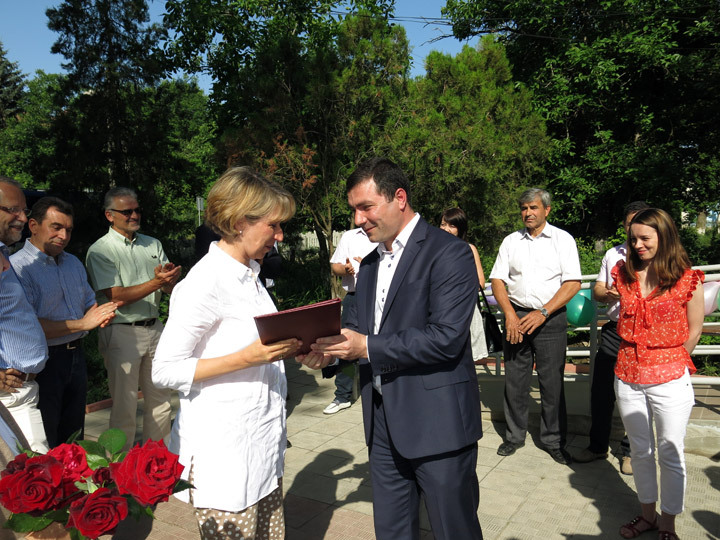 The German organization “Hilfe für Osteuropa e.V.” / Todtnau, President Mrs. Ursula Honeck, delivers transports with humanitarian aid to Moldova over 19 years. In the course of these years the people in need from our country received many humanitarian goods that improved their lives a little. The last transport with humanitarian aid from this year arrived on December 17. The humanitarian goods were distributed on the same day. 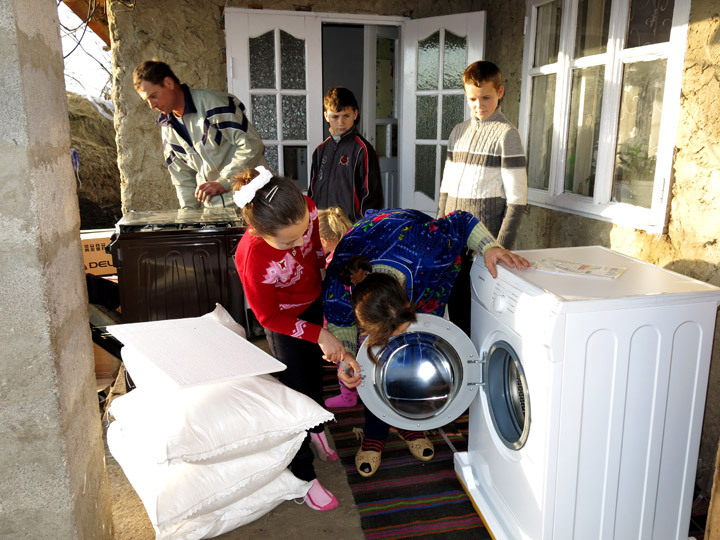 Our projects for children and old people received especially detergents and washing liquids. The whole transport with humanitarian aid had over 16.6 t, among them over 8 t of detergents and washing liquids. In addition to these things, our projects received also clothes, bed linen, shoes, towels, toys, toothbrushes, etc. Our beneficiaries are very happy about all things they’ve got, because this happened before Christmas. It was a real Christmas present for poor children and old people. 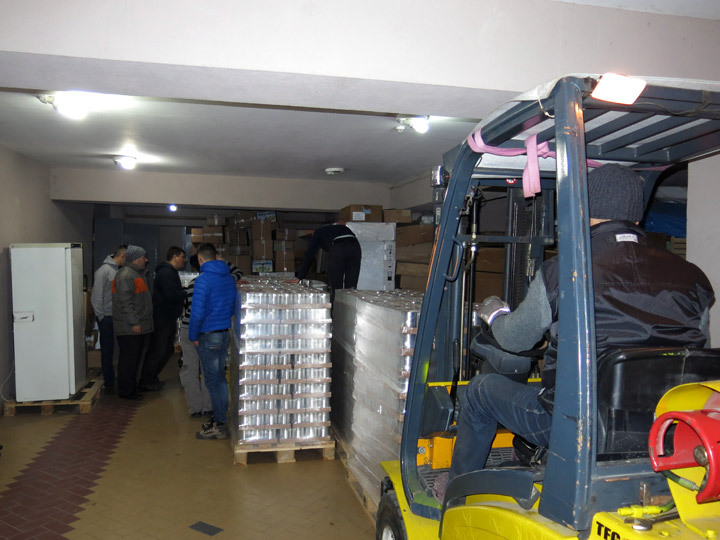 A transport with humanitarian aid was delivered from Liechtenstein to Moldova at the beginning of December. 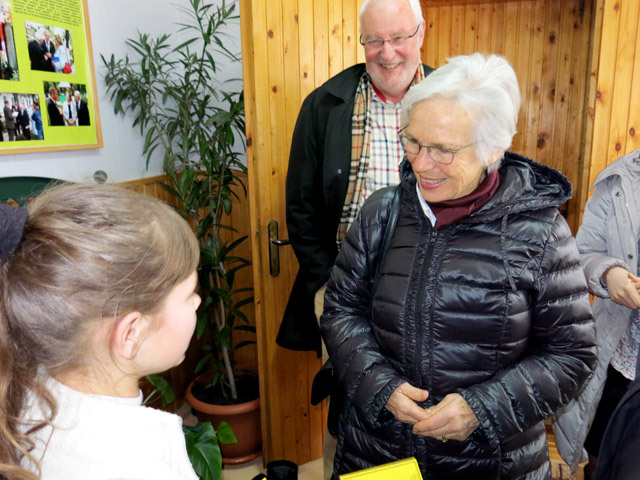 Hilfswerk Liechtenstein, President Mrs. Beatrice Amann / Triesen, sends humanitarian aid for needy children, old people and families at least once per year. With this transport tinned food (peas and carrots, beets, potatoes – a total quantity of about 20 t), clothes, flat screens, musical instrument, school supplies were delivered. Especially the children projects, financed by Hilfswerk Liechtenstein, received a part of the humanitarian aid. This is a great help for needy people, who are very grateful for any support. It was also a beautiful present for Christmas. The Swiss Foundation swisscor organizes annually medical camps for disabled, poor children, who need a medical investigation and assistance. The swisscor-camp lasts two weeks in Switzerland and offers complete medical services to the children between 9 and 13 years old. The Republic of Moldova takes part in the swisscor-camps too. The Ministry of Labor, Social Protection and Family and the Ministry of Education make the selection of the institutions. 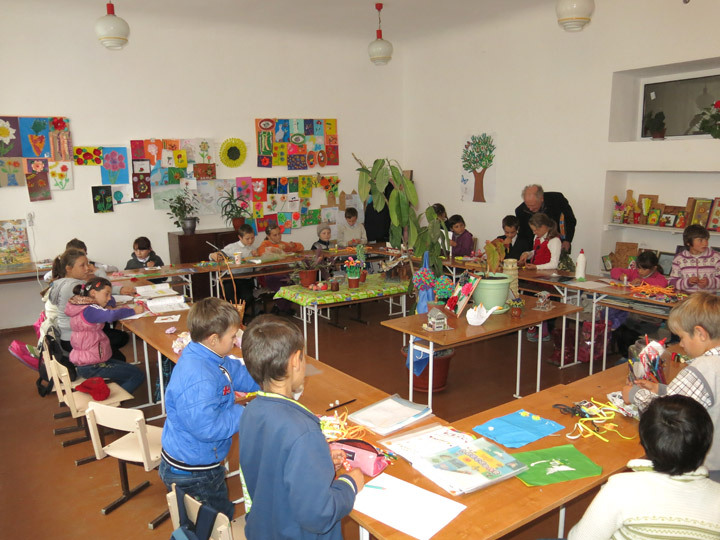 Five children from the day care center BUNVOLENTIA Cojusna will also go to the next camp 2015. A contract between all participants in the swisscor-camp 2015 was signed at the Ministry of Education today, November 14th. At the meeting took part the President of the Foundation Council, Mr. Dieter Weber, the General Secretary of the Foundation, Mr. Jörg Rickenmann, the Deputy Minister of the Ministry of Education, Mrs. Liliana Nicolaescu-Onofrei, the Deputy Minister of the Ministry of Labor, Social Protection and Family, Mr. Sergiu Sainciuc, the President of the Charity Association, Mr. Vladimir Nadkrenicinii. The swisscor-camp 2015 will take place during the period of July 16th – 30th. Ca. 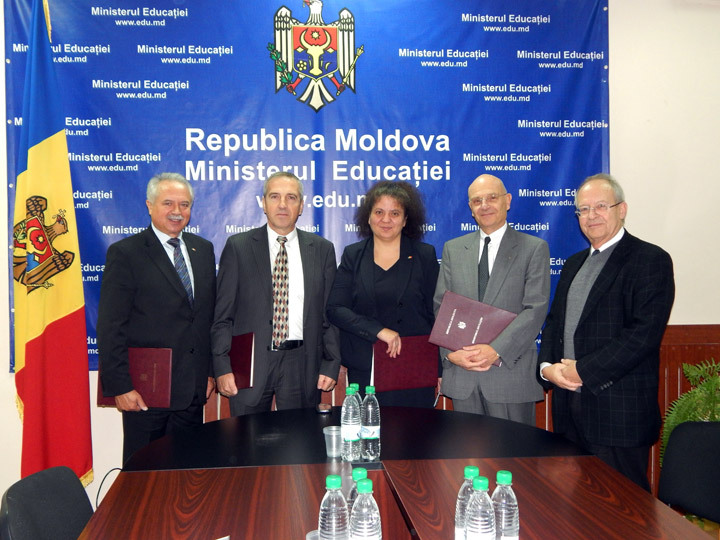 70 poor, social disadvantaged children from Moldova will enjoy a stay in Switzerland. The district football championship among the junior teams from the district Singerei was organized in summer 2014. The junior football team from Grigorauca also participated in the championship. The boys from this football team attend the day care center for children „Saint Maria“ and train themselves on the sports and playground of the center under the guidance of the sports teacher, a former football player. 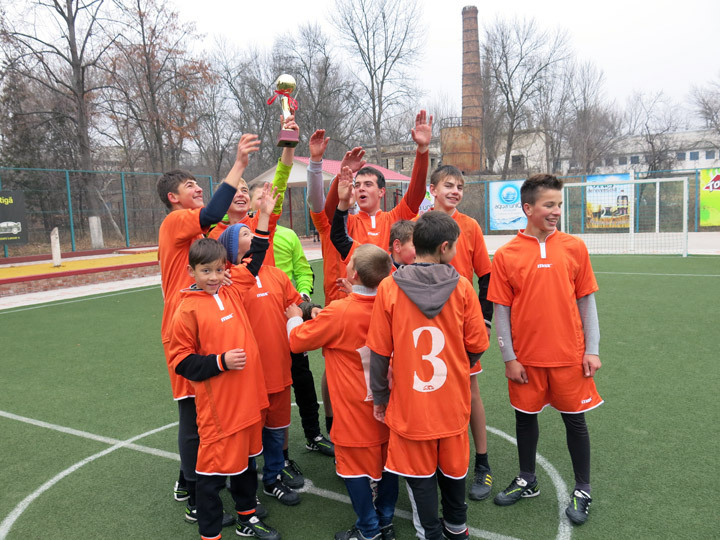 The junior football team from Grigorauca contested the victory in its group with six teams. It came first and qualified for the district final. The final will be played in summer 2015. It is a great achievement for our boys from the day care center, who worked hard for it. 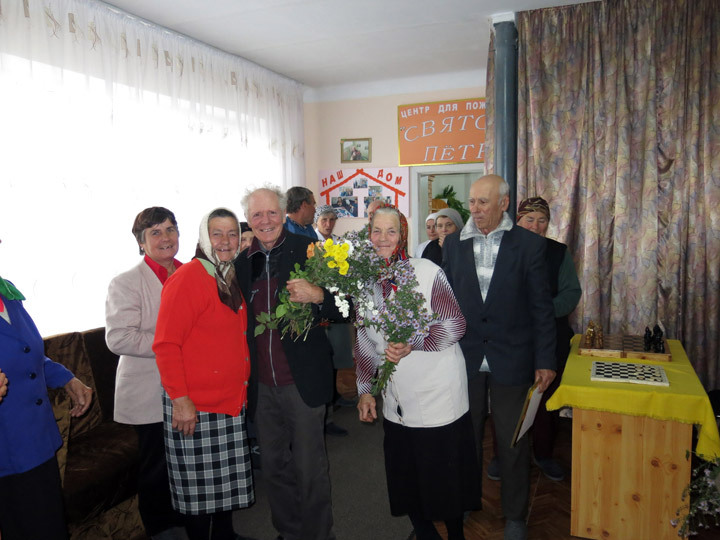 The day care center for elderly „Sfintul Petru“ was opened on October 1st 2008. The running costs of the center are financed by the Swiss organization „Help for Children in Need“ (HCN) / Evilard. 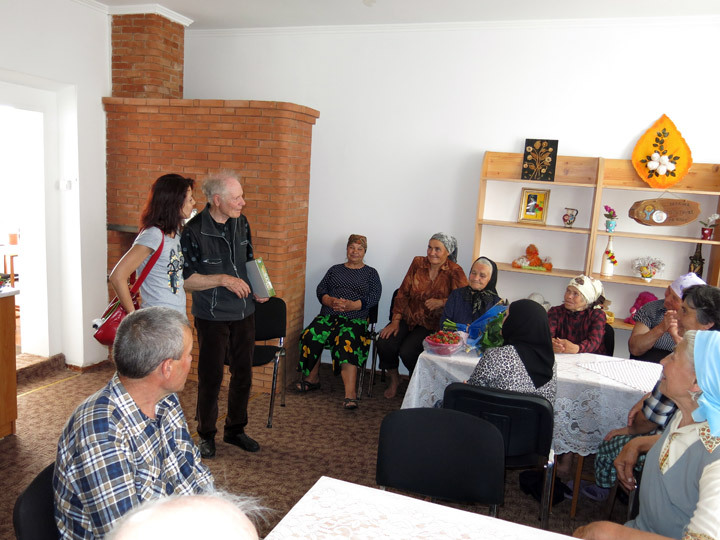 The day care center is like a home for old, lonely, poor and ill people, who find here balanced nutrition, medical assistance and an occupation. Their pension is too small to afford themselves good meals or to buy medicines. In the center they eat soup, potatoes, rice, different kinds of mashes, peas with meat, fish, sausage, mushrooms, salads, as well as pancake, cookies, bread with butter, rolls, candies with cocoa or tea. They also receive the necessary medicines, measure their blood pressure. 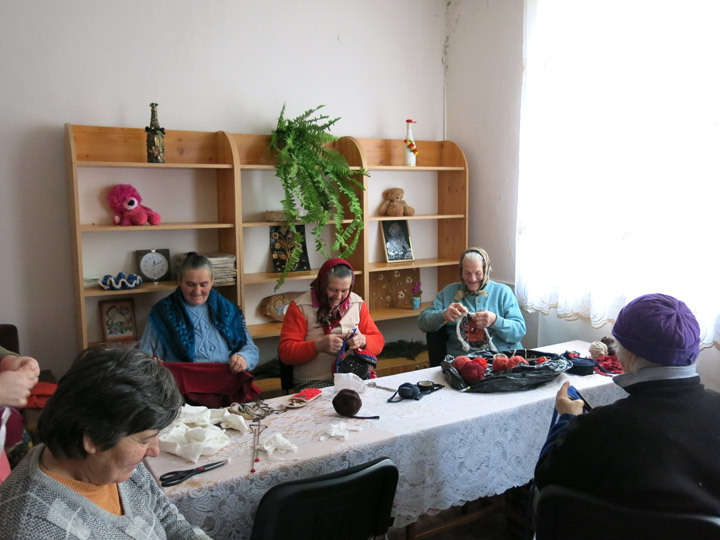 In addition to that they have an occupation: sewing, knitting, reading etc. They pray together. There are 25 old, lonely and ill people in the project at this point. 16 of them come daily to the center. The other 9 are bed-ridden and ill. They are looked after at home. A group of volunteers brings them the meals at home. Mr. Garst, the president of HCN, could visit the center at the end of October. They all had great pleasure talking with each other and laughing. 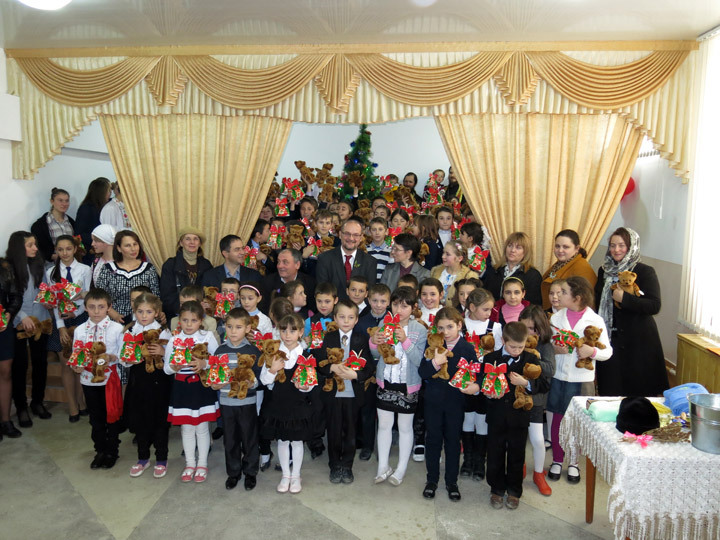 Mr. Peter Garst, the President of the Swiss organization „Help for Children in Need“ (HCN) visited Moldova for the second time this year. It was his 25th trip. Mr. Garst could travel to nearly all villages to visit the day care centers for children BUNVOLENTIA. Of course he observed the children on their activities. Everywhere they gave him hand-made gifts and many flowers. 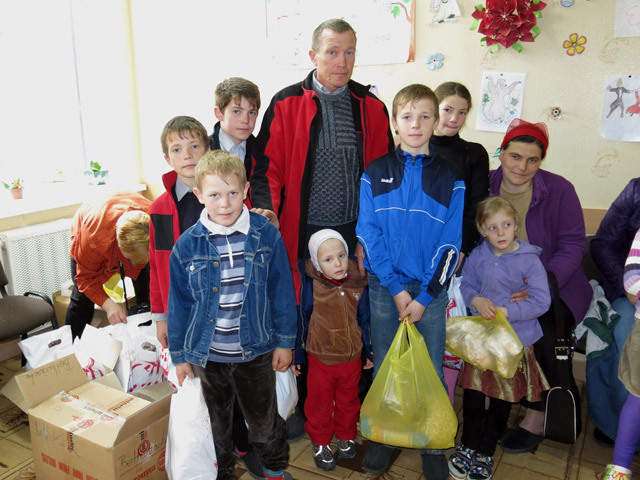 Mr. Garst also met the financially supported children and families from Grigorauca. He enjoyed talking with the families. 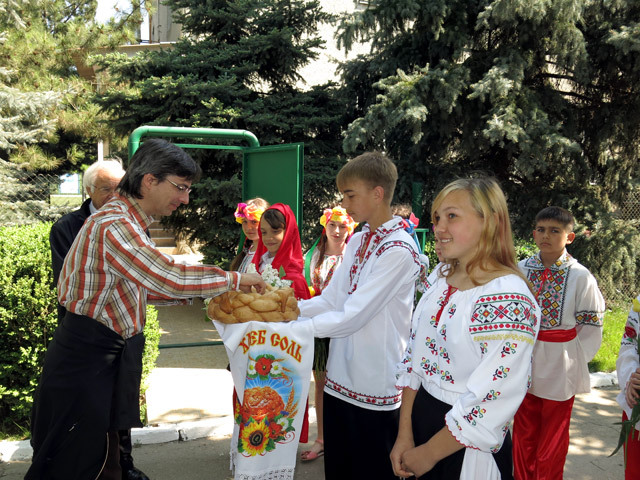 In Chisinau he spoke with some students, supported in their study within an aid program. Mr. Garst participated at the 14th seminar for coordinators, educators and cooks of the day care centers for children BUNVOLENTIA. It was an informative and interesting meeting. 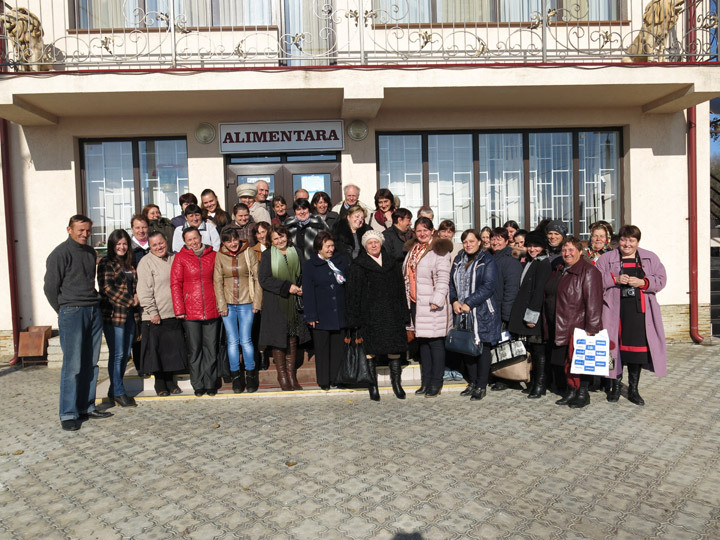 The 14th seminar for coordinators and teachers of all day care centers BUNVOLENTIA took place in the center of the commune Grigorauca on October 25, 2014. The cooks were invited this time too. 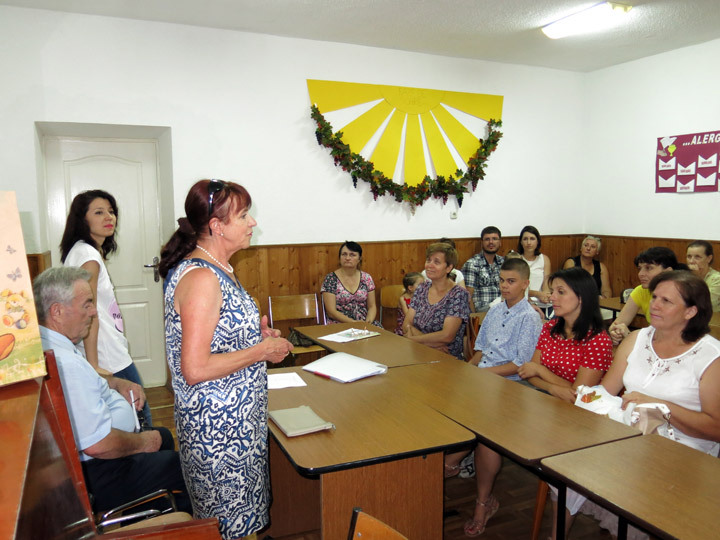 The coordinator from Grigorauca, Mrs. Svetlana Pasa, gave a very interesting presentation. After that, the representatives of the day care centers could talk about their activities with the children, especially the problems and difficulties were discussed. The deputy of the head doctor of the sanitary-epidemiological station of the district Singerei was invited to the meeting with the cooks. He spoke about the correct processing of food, as well as about dishes, cutlery and about the newest hygiene standards. The traditional meeting with the students from the Bursary Program, financed by Solon Foundation / Luzern took place on September 27, 2014. Each year, at the beginning of the school year, the students are brought together, in order to explain them the conditions of the project. At the same time they sign a contract with PRO UMANITAS. One of the conditions is the social work, which the students have to carry out. It is to mention that the most of them are implied in different social projects within the church or our children projects. During the meeting the students expressed their gratitude to Mr. Douglas Funk from Solon Foundation and handed over letters of thanks. 50 students from deprived families are included in the project this year. 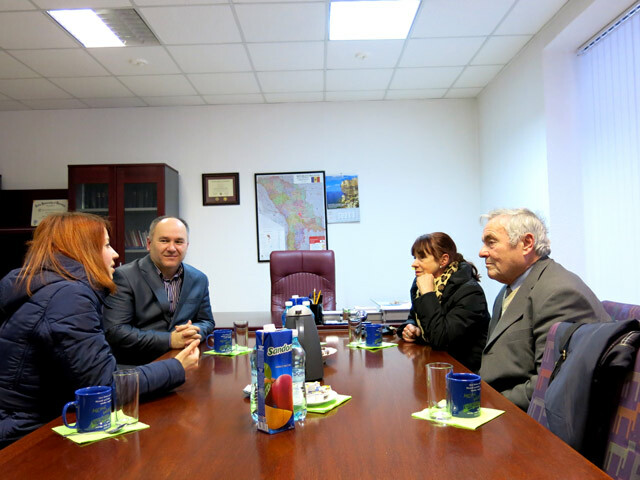 Mrs. Ursula Honeck, President of the German organization „Hilfe für Osteuropa e.V.“, and Mr. Gunther Köllner from the same organization came on visit to Moldova, in order to see their projects. 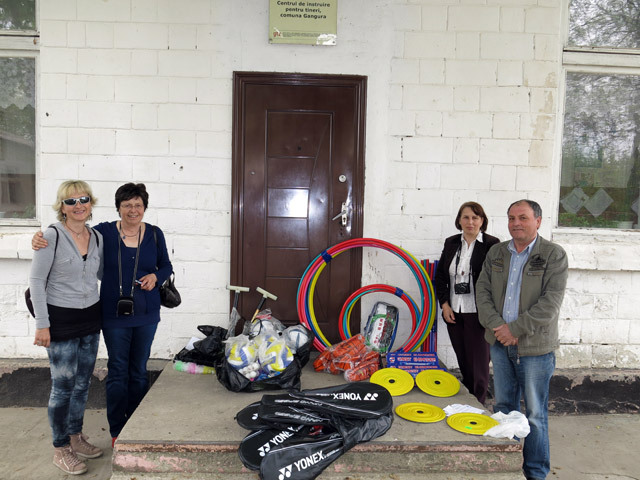 Mrs. Honeck and Mr. Köllner travelled to Orhei and Edinet, to solve the questions regarding the transport with humanitarian aid that comes in August. 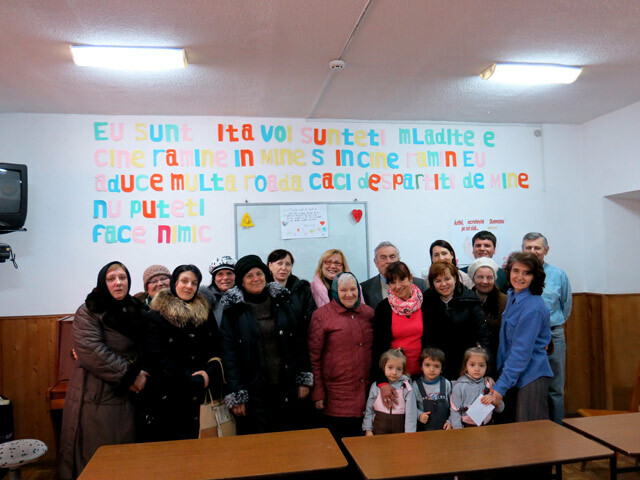 In Chisinau our guests visited the children clinic „Emilian Cotaga“ and the republican hospital. The children clinic „Emilian Cotaga“ received knifes for the dermatome, a gift, which is highly appreciated by the doctors from the burns department. 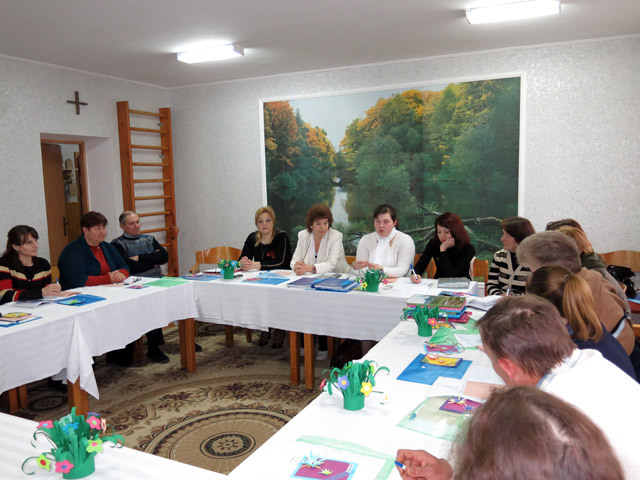 At the same time a meeting with the financed families took place in Chisinau. Mrs. Honeck and Mr. Köllner handed them money from their sponsors from Germany. This support is very important for these poor families. They are very grateful for it. Summer is a time that one desires and appreciates as a pupil. Summer holidays are a further reason for joy for the children from our day care centers BUNVOLENTIA: the summer camp begins. 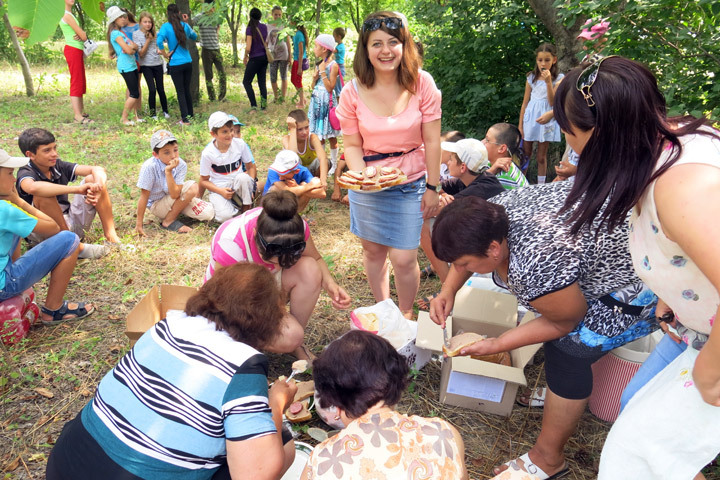 Whether swimming, strolling through the capital of Moldova or simply relax, the summer camp offers activities and recreation to the children. 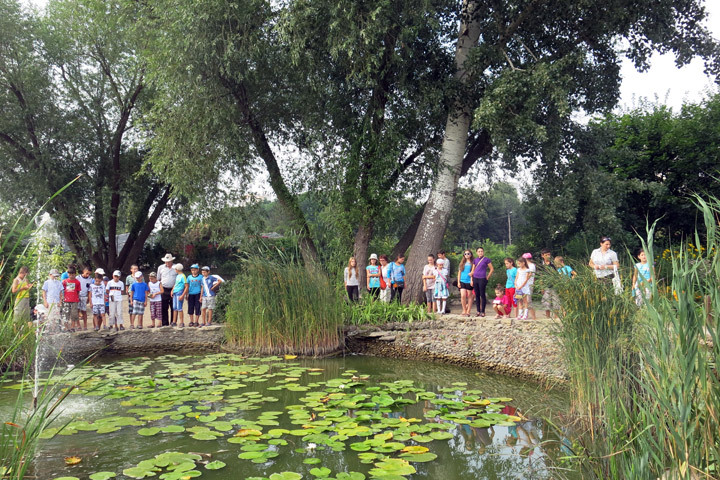 They could visit the most beautiful park in Chisinau, the botanical garden and the zoo this year too. 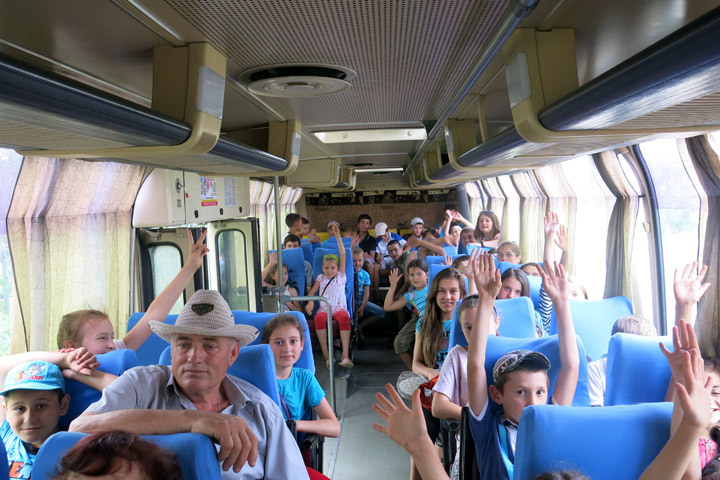 The children from the day care center BUNVOLENTIA Cojusna got behind the history of the country during the attendance of the historical museum. The children from 9 day care centers BUNVOLENTIA in the district Singerei enjoyed their time together with the children from the day care center “Saint Maria“ / Grigorauca in the recently opened water park in the city Balti. The summer camp enclosed altogether 452 children (incl. 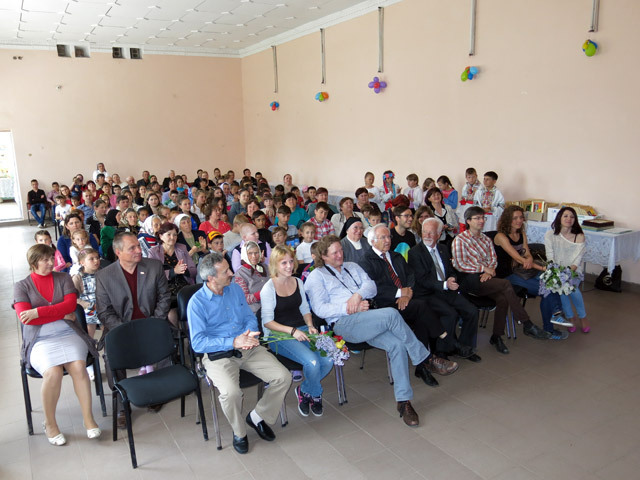 130 children from the day care center “Saint Maria”). 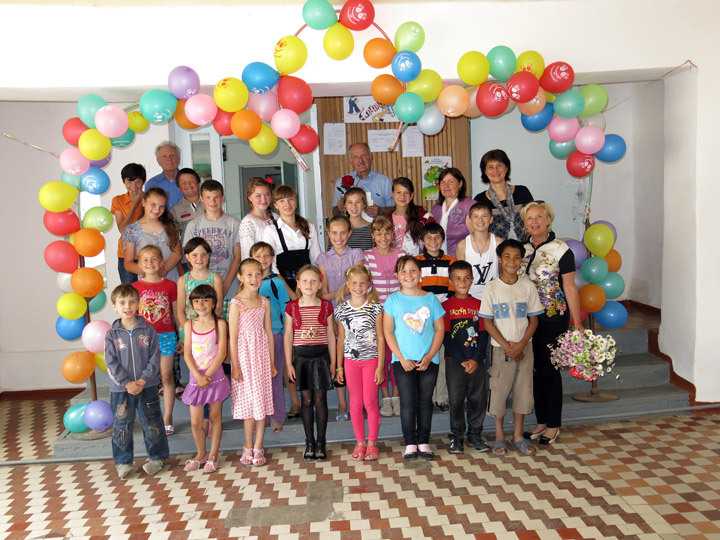 The children of the day care center “Saint Maria” from Grigorauca can enjoy their summer holidays. They have great pleasure in summer holidays and summer camp, which is traditionally organized. The children were in the recently opened water park in the city Balti. They gamboled in the water, swam and had fun on water slides and water play areas. After hours of joy they ate well. 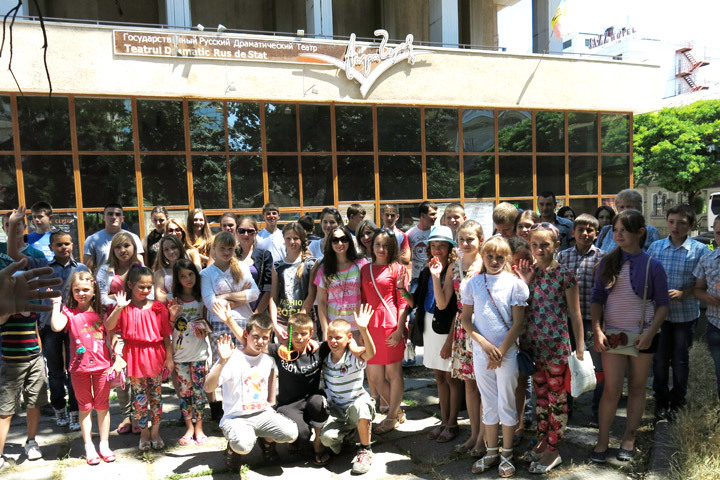 At the same time, the children, who visit the puppet theatre and the dance lessons in the day care center, were to the theatre in Chisinau. After performance the children refreshed themselves with meal and drink and returned home full of beautiful impressions. 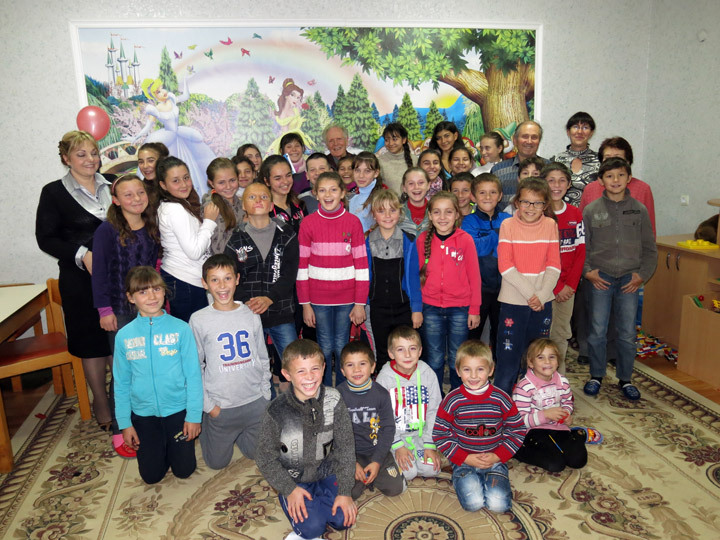 The President of the Swiss organization „Help for Children in Need“ (HCN), Mr. Peter Garst came to his 24th visit to Moldova. 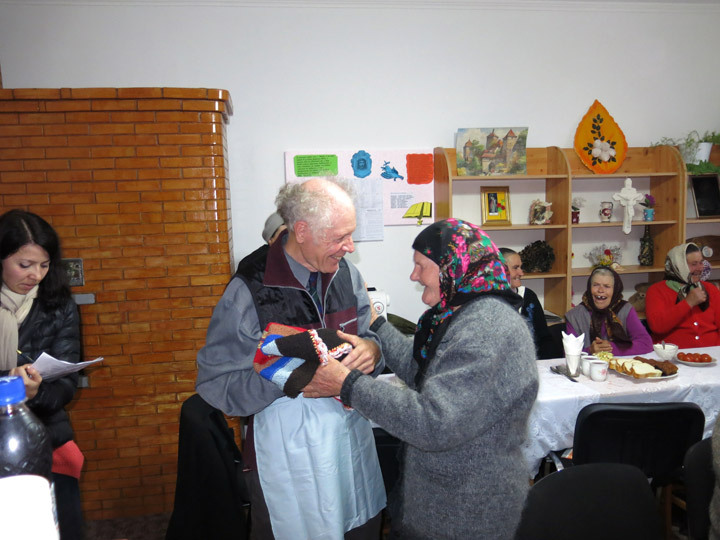 Main focus of the trip was the visit of all day care centers for children BUNVOLENTIA, the day care center for elderly „Sf. Petru“ and the financial supported families. 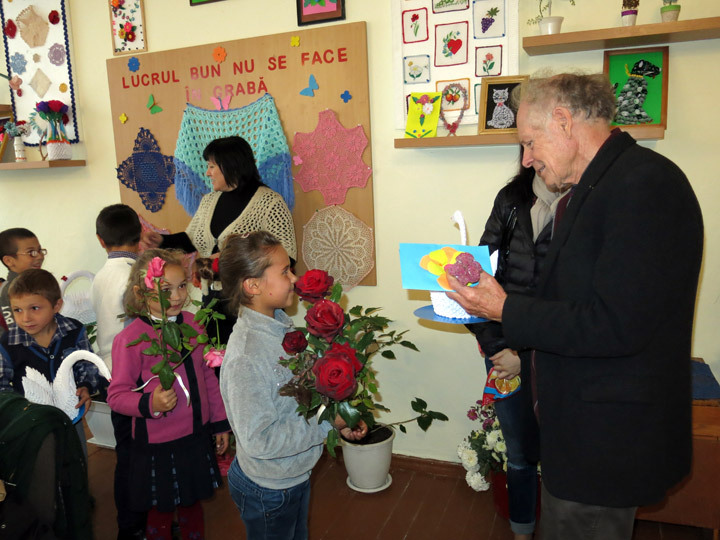 Mr. Garst could visit 14 day care centers of HCN and participate at the official opening of the day care center for children BUNVOLENTIA Copaceni II. 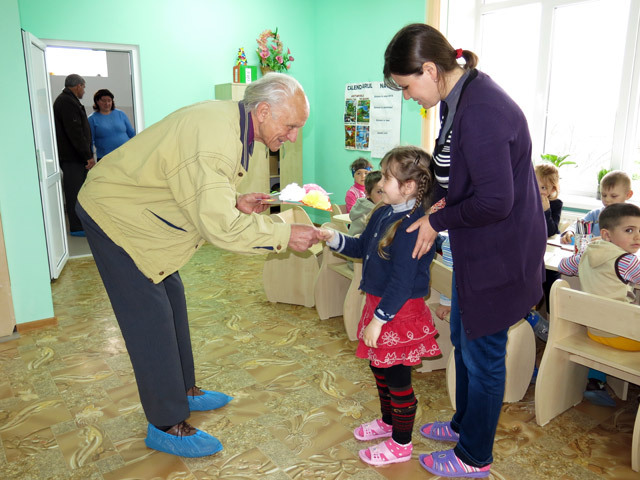 In Grigorauca he visited the center for elderly „Sf. Petru“ and discussed with the old people. 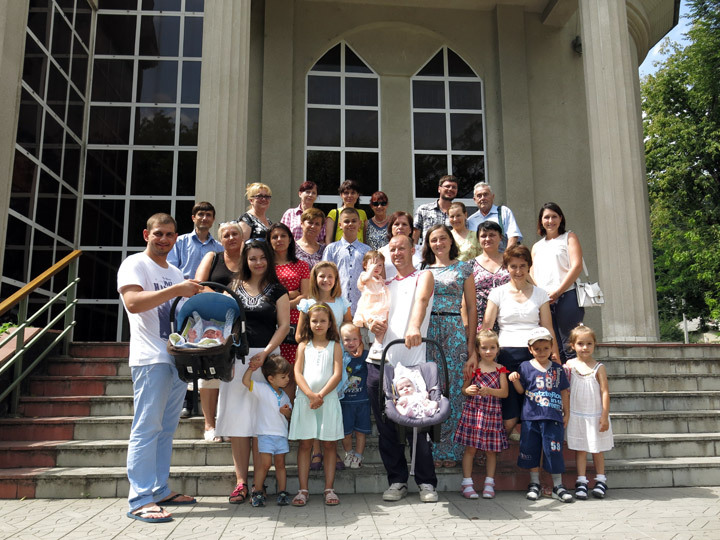 The President of HCN met also the financial supported families from Ochiul Alb, Grigorauca and Misovca. He convinced himself again of the good development of HCN projects in Moldova. 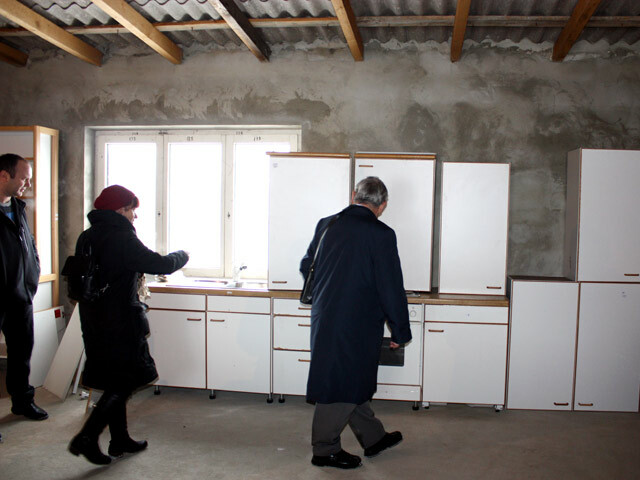 Mr. Garst visited also the village Sarata Galbena, in order to examine the possibility of implementing of a bakery. 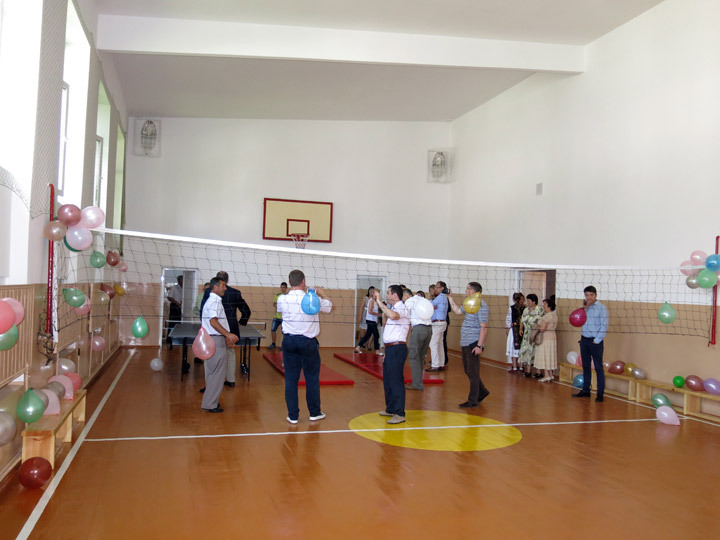 A special event in the village Gangura took place today – the official opening of the gym in the school from Gangura. The school from Gangura was built in 1967 and is receiving now 158 children. One of the biggest problems of the school was the bad condition of the gym. The gym was not repaired for over 30 years. The children did not have possibilities for the sports training in bad weather. Due to different sponsors we could accomplish the necessary repair works and purchase sports equipment and facilities. At the official opening of the gym took part Mr. Stefanie and Dr. Thomas Kirchberg, President of Südzucker AG / Germany. Mr. and Mrs. Kirchberg took over a big part of the financing of the project. They also made a substantial contribution to the repair of the local kindergarten. At the event were also present: the President of the district Ialoveni, Mr. Lilian Popescu, the Mayor of the commune Gangura, Mr. Ivan Basli, the school administration and other local authorities. The President of the district expressed his gratitude for the accomplished project and handed thank letters out at all sponsors. Mrs. Helen Zühlke visited on behalf of Rotary Club Zug-Kolin, together with another representative of the club, the day care centers for children in the commune Gangura today. In the day care center BUNVOLENTIA Misovca, financed by Rotary Club, Mrs. Zühlke distributed t-shirts, toothpaste and toothbrushes for children. 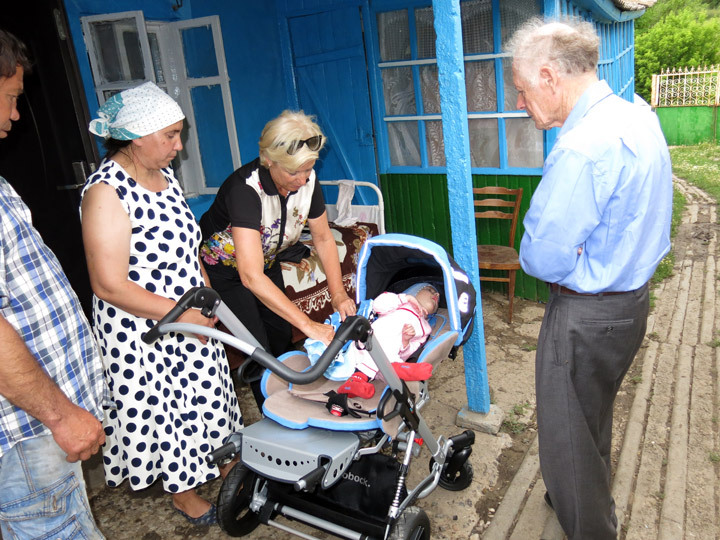 She visited also the family Scripnic with the severely handicapped child, Eugen. For the small Eugen, who suffers from infantile cerebral paralysis, Mrs. Zühlke brought a rehabilitation buggy. 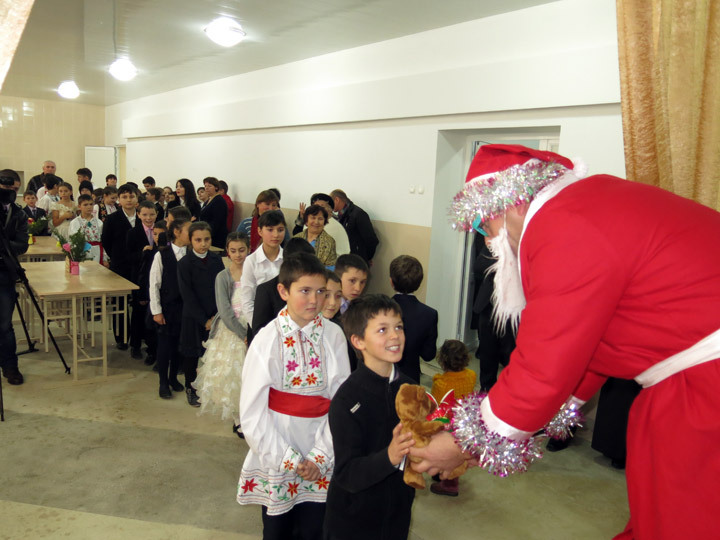 She could also greet the children from the day care centers BUNVOLENTIA Alexandrovca, Gangura I and Gangura II and distribute sweets. 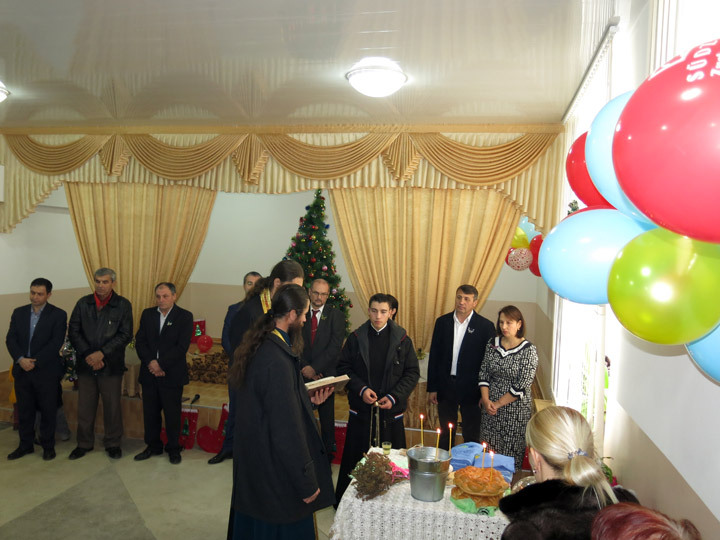 24 poor, large, socially deprived families with altogether 93 children from the village Grigorauca experienced a beautiful children’s day. 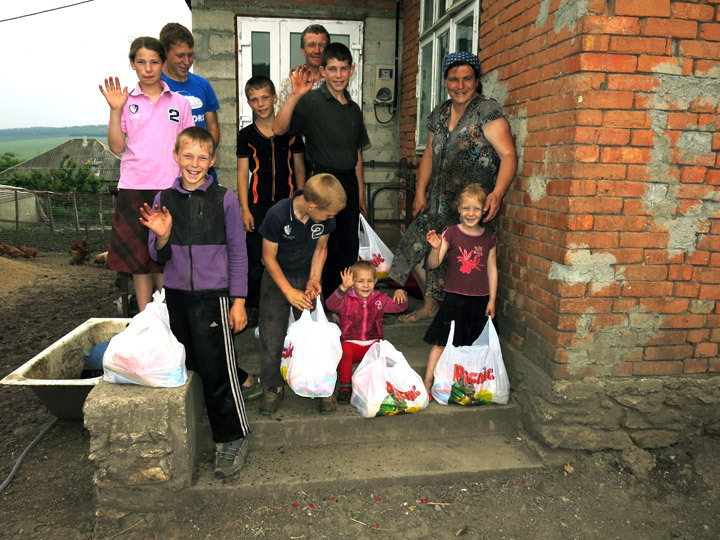 These families received a great support in the form of food parcels from Mrs. Regina Weiss / Nettetal. A food parcel contains: rice, buckwheat, spaghetti, sugar, chicken meat, oil, condensed milk, cookies, sweets. 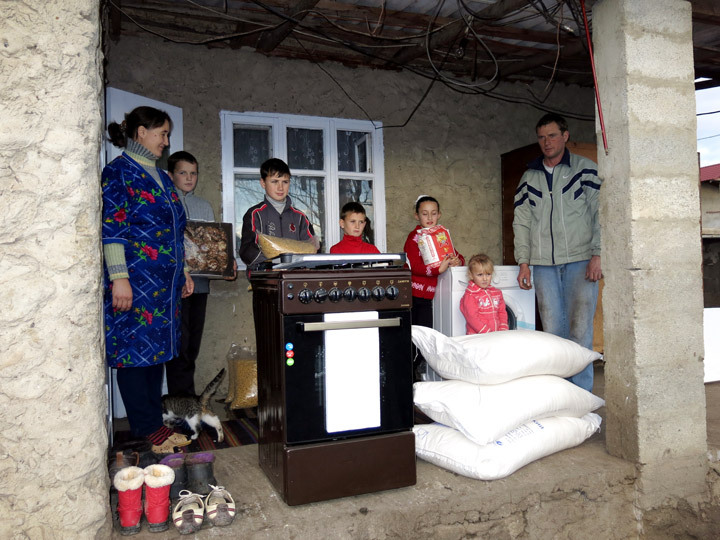 The families are very grateful for the rendered aid. Priest Hans Bock, Dr. Robert Roithmeier with his team from „Menschen helfen e.V.“ and priest Erwin Benz from Switzerland support the projects of PRO UMANITAS for many years. 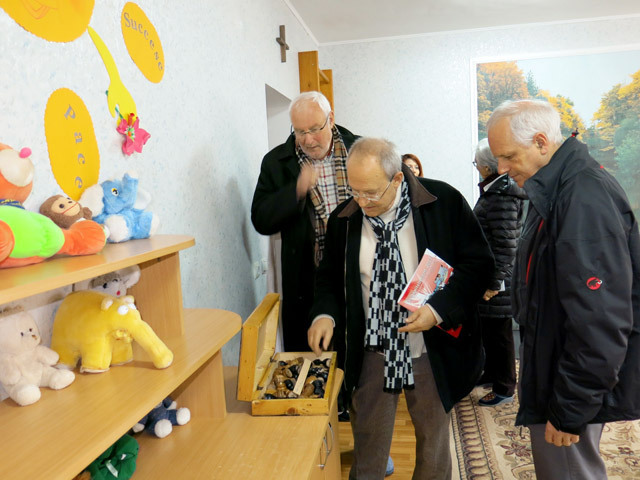 They visit the day care center for children BUNVOLENTIA in Cojusna, a poor family in Misovca, the projects BUNVOLENTIA in Gangura, the church from Tiraspol that is in the making, as well as the day care center for children „Saint Maria “ in Grigorauca. They meet healthy and happy children everywhere, as well as motivated and engaged personnel. In Grigorauca the guests are surprised with an impressive run of a puppet theatre, dances and songs on a high level. An agape with round 140 children crowns the meeting. – To be mentioned the meeting with the organ player Anna Strezev. 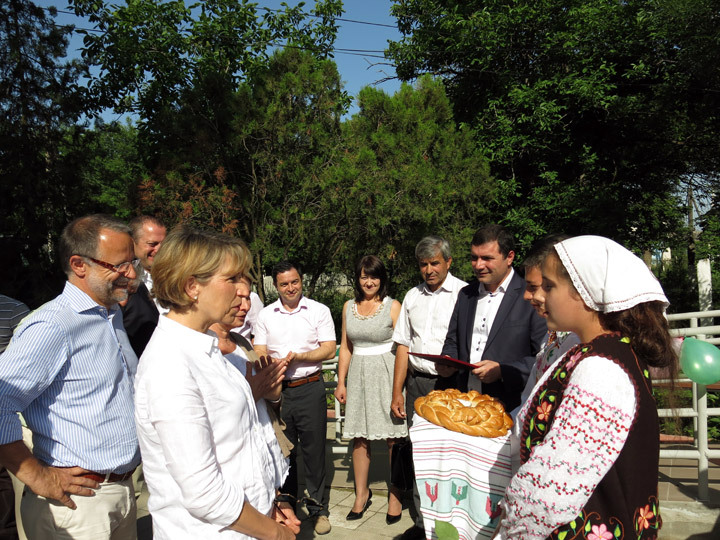 Mrs. Bernadette Posch / Austria and Mrs. Angelika Triendl / Austria came to Moldova to visit their project in the village Gangura. 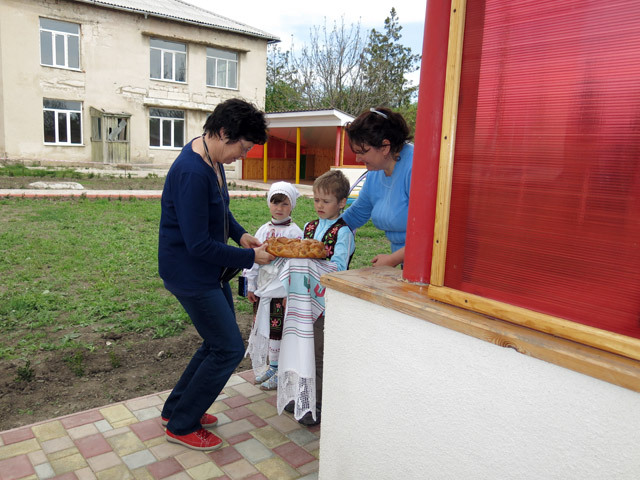 Through „My 2 Cents“ association, a pavilion in the local kindergarten was repaired. Mrs. Posch and Mrs. Triendl made a big surprise for the small children of the kindergarten: they brought Austrian sweets and shared them with the small ones. A music system was also donated to the kindergarten. It was a real joy for the small children. Boys and girls danced on cheerful music rhythms of children songs at once. Another surprise was the sports inventory – footballs, basketballs, volleyballs, handballs, volleyball net, jumping ropes, pumps, gym circles, table tennis rackets, badminton rackets, stopwatch, table tennis table, etc. – for the gym, which is in repair process now. Mrs. Posch and Mrs. Triendl handed over the sports inventory to the principal. 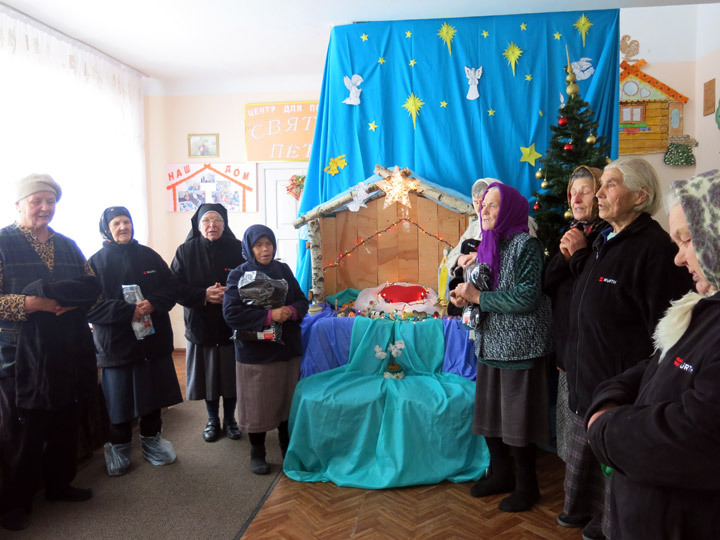 A beautiful action took place in Grigorauca village on the eve of Easter. 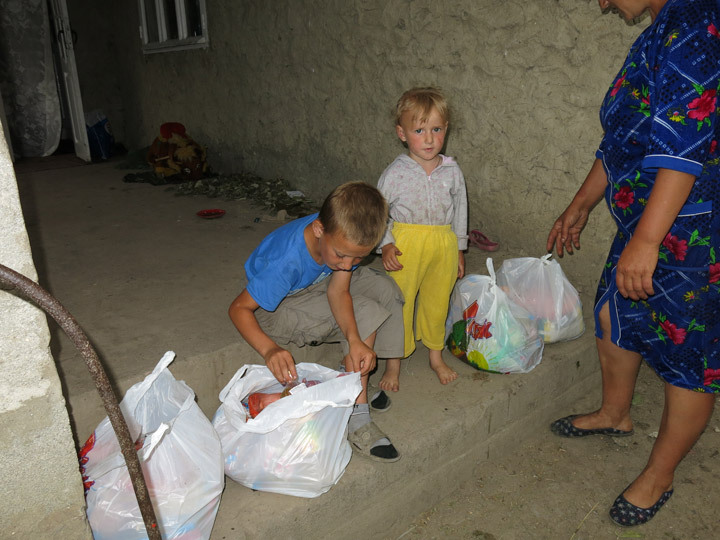 The poorest families from the village, whose children attend the day care center for children “Saint Maria”, received food parcels. The Easter action included 18 families (altogether 60 children). A food parcel contained meat, sausages, sugar, rice, different kinds of mash, etc. The families are very gratefully for the rendered help, especially on occasion of this important church feast. The Easter action was possible due to the support of Mrs. Regina Weiss / Nettetal. Mr. Manfred Ahlbrecht / Ihn came to his next trip to Moldova. He visited the projects of „Pro Moldavia e.V.“ / Gladbeck in the commune Gangura, where he could make conversation with the mayor of Gangura and the vice-president of the district Ialoveni. He visited also other projects of PRO UMANITAS and examined the possibility of implementing new projects. 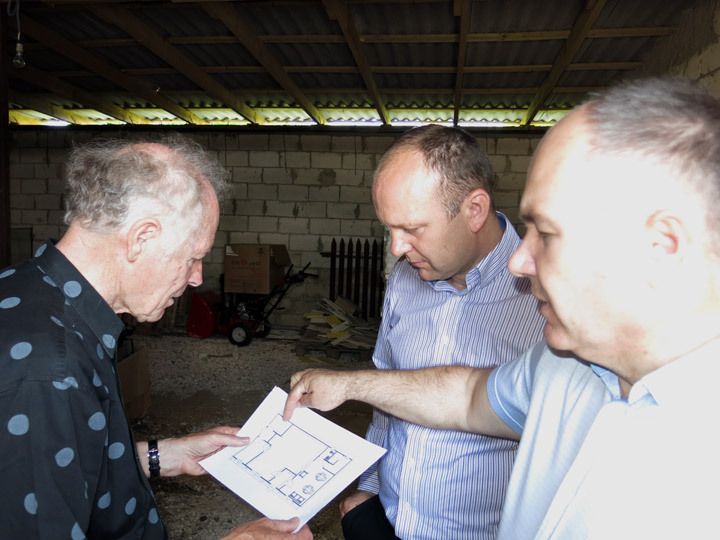 Dr. Klemens Büscher from the German organization „KINDERMISSIONSWERK “ / Aachen, responsible for the projects in Moldova, visits our country and the projects of the organization. He makes a trip to Gangura to the kindergarten on 14.04.2014. 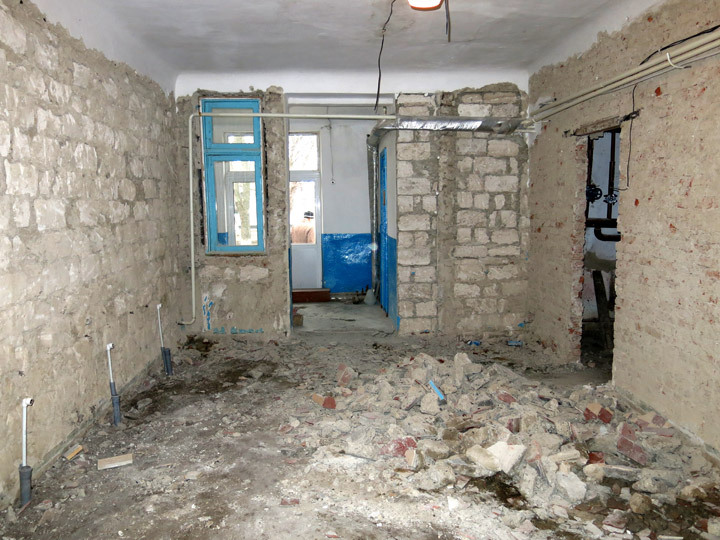 „KINDERMISSIONSWERK“ supported the interior repair of a block for 40 children from the commune Gangura. The small children receive him cordially with flowers and handmade presents. It is to mention that this project was possible due to the Sternsinger-action. 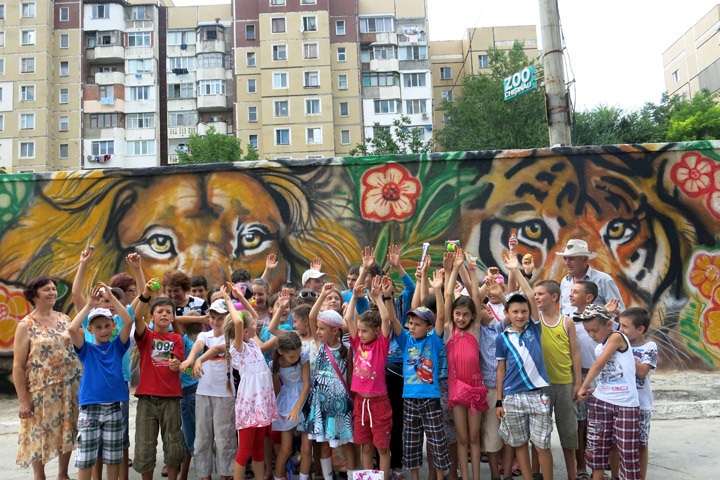 It is a beautiful action of German children for Moldovan children. It is a sign of love and care for the one’s neighbor. 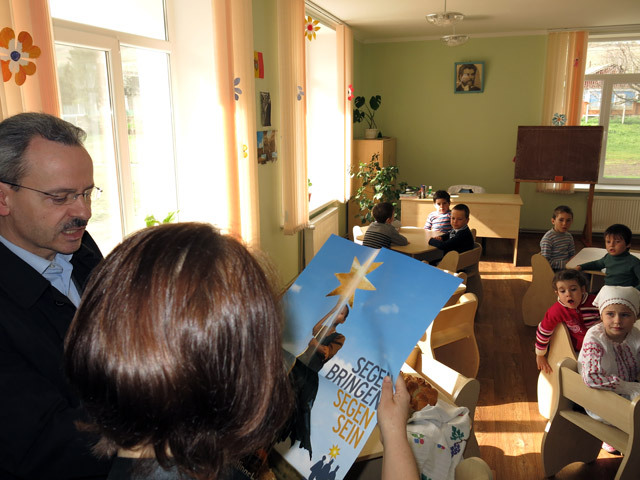 Dr. Büscher brings lapel pins with stars, the symbol of „KINDERMISSIONSWERK“ and gives them to the small children as a token of effort and commitment of the German children. 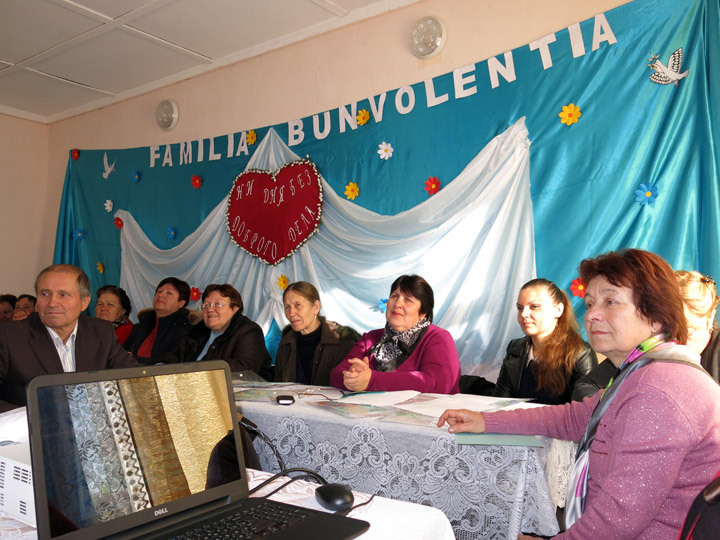 The 13th seminar of the coordinators and educators of the day care centers for children BUNVOLENTIA took place in Cojusna village on 12.04.2014. 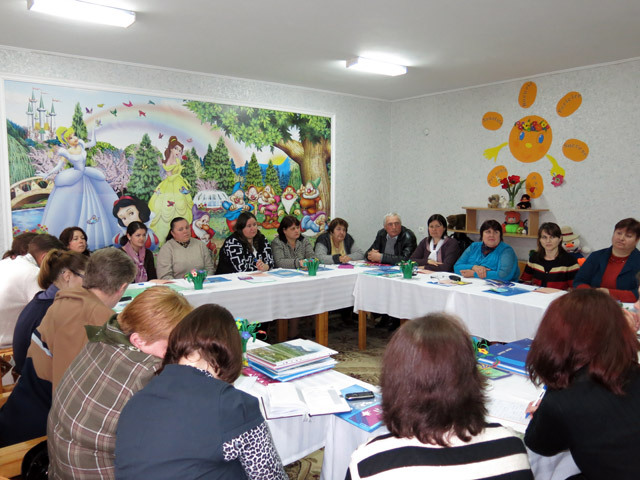 The coordinator and the educators of the day care center BUNVOLENTIA Cojusna received guests from other centers BUNVOLENTIA, so that altogether 24 persons participated at the seminar. Each day care center was represented by one educator. It was an informative meeting as always; the educators talked about the new children’ activities, about the difficulties, which are faced with in the working process, about their whishes and future plans. The Swiss foundation SWISSCOR offers medical care to needy children from crisis and conflict regions (incl. 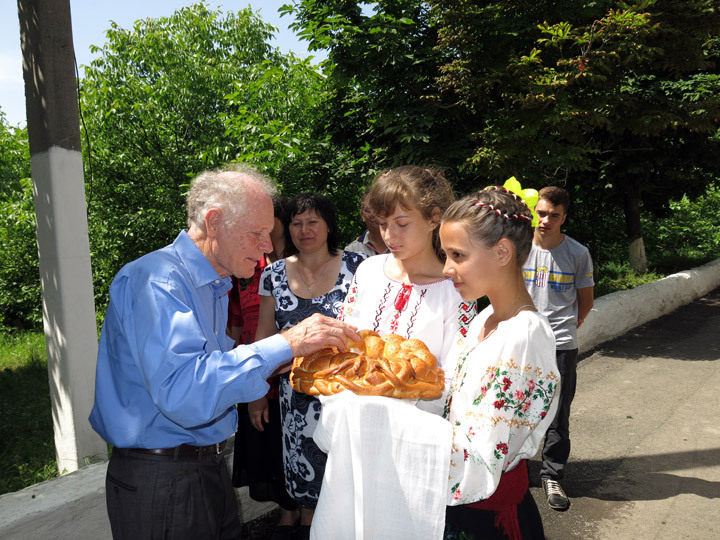 Moldova) within medical summer camps in Switzerland. 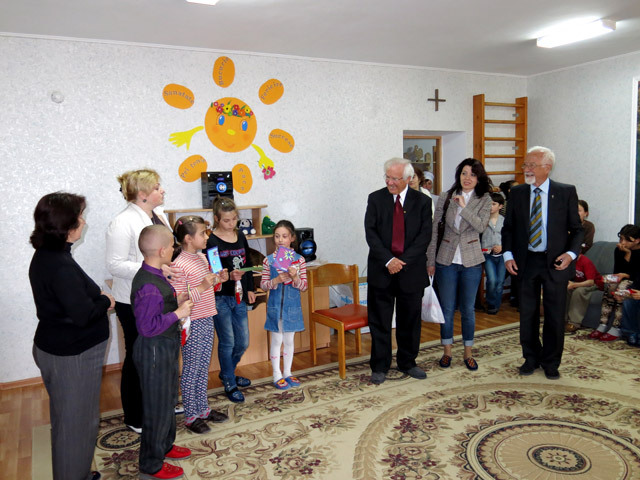 During their short visit to Moldova the General Secretary of the foundation, the Vice-President of the Council together with a small group visited also a project of HCN – day care center for children BUNVOLENTIA Cojusna. Our guests were impressed by the good conditions, which are offered to the needy children through PRO UMANITAS. An important event for PRO UMANITAS has taken place today. The Charity Association was recognized by the state as an organization of general utility once again. The appropriate certificate was revalidated for the further three years. It is to mention that PRO UMANITAS receives the certificate for organizations of general utility for the fourth time. 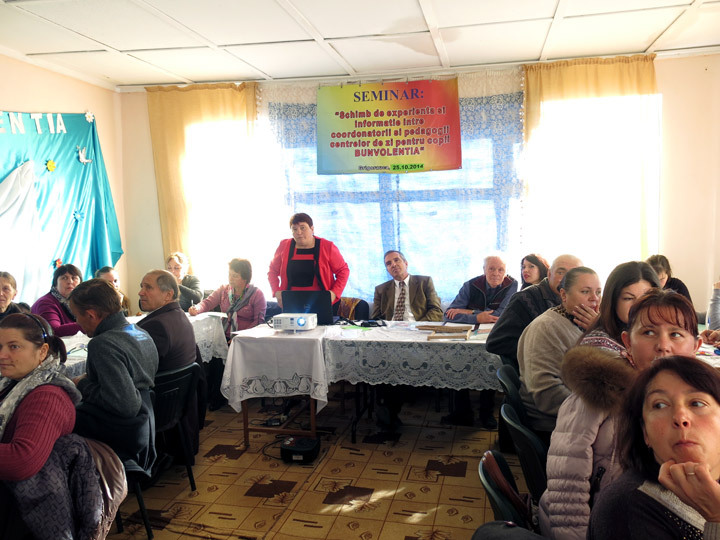 The annual general meeting of the founders and members of PRO UMANITAS (PU) took place on January 30, 2014. 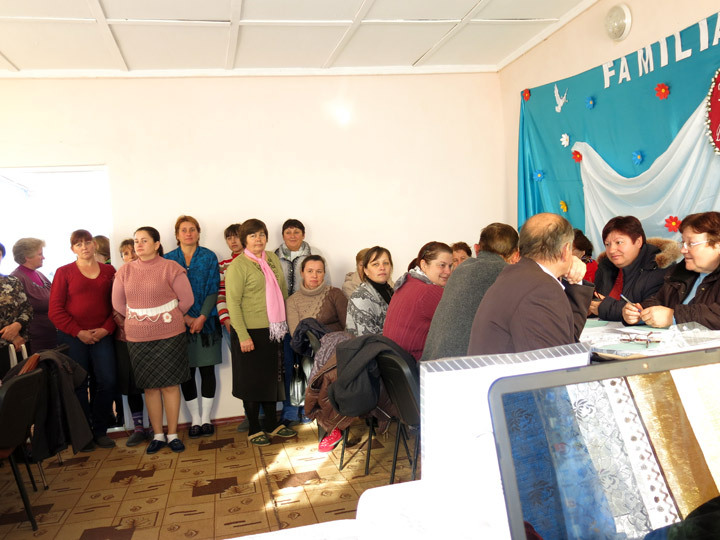 Within the meeting the projects from 2013 and the future projects of the charity organization were discussed as well as the work plan and the budget for 2014 were approved. At this meeting a decision was made to gather all required documents for the revalidation of the certificate for organizations of general utility. It is important to mention that PU has already received this certificate three times. The president of the German organization „ Hilfe für Osteuropa e.V. “, Mrs. Ursula Honeck and her brother, Mr. Gunther Köllner are traditionally our first visitors in 2014. With this visit they bring great joy to the poor people, who are supported by the organization. 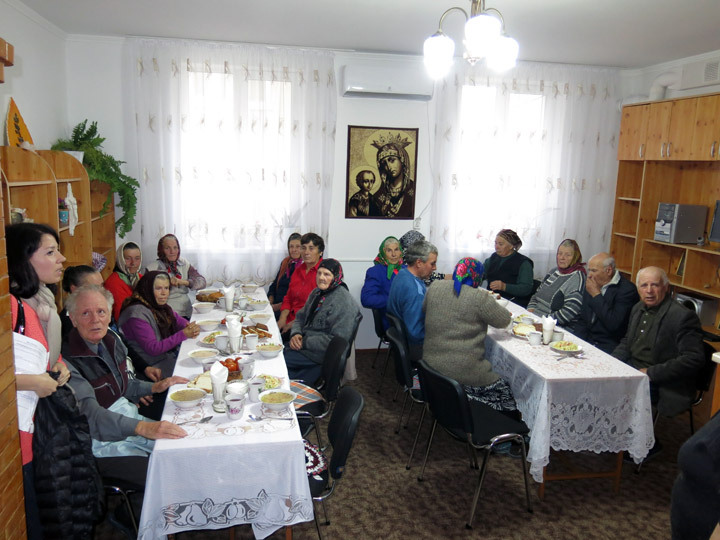 The donators from Germany give to the Moldovan sponsoring families through Mrs. Honeck and Mr. Köllner not only money, but also a part of their soul. The meeting with the sponsoring families was very emotional, as always. 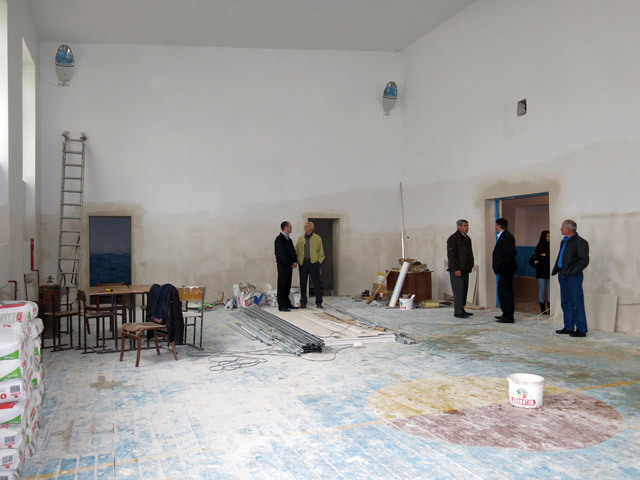 At the same time, our guests made a visit to the Pentecostal Church and its projects. The Pentecostal Church received a part of the humanitarian goods from the German organization, and used them very well; Mrs. Honeck and Mr. Köllner could convince themselves of it. 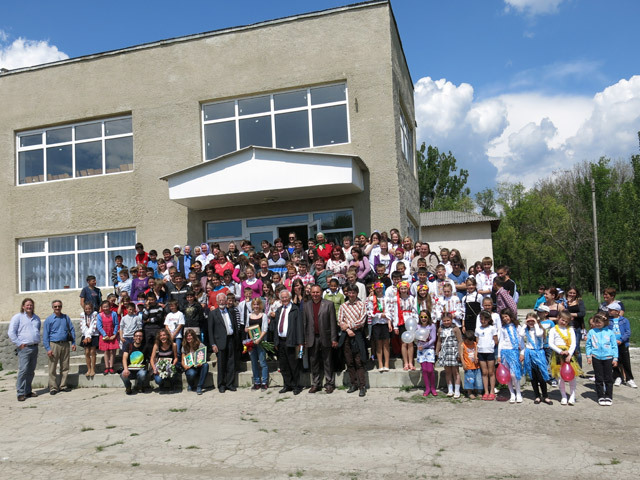 The guests visited also their projects in Orhei and Edinet. With great joy we would like to announce that our annual Report of Activity 2013 is now available on our website under the Reports section.